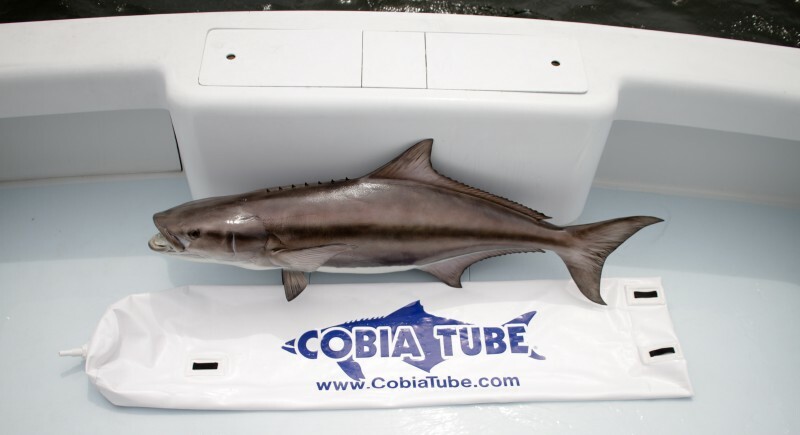 Cobia Tube – The Extreme Portable Livewell! Introducing the COBIA TUBE: The Cobia fisherman’s newest product that will help shape Cobia Fishing Tournaments of the future. The Cobia Tube is a flexible onboard live well that will keep any Cobia caught, netted, and boated, alive for extended periods of time. Cobia fishing is popular around the world, with hotspots ranging from Destin to Orange Beach, from Key West to Charleston, and even “down under” in Australia. Now, all those anglers will have the option of catching, culling and releasing any size Cobia. With the Cobia Tube, fishing tournament organizers can establish a Cobia catch-and-release division, or an all-release policy, akin to Bass and Red fish tournaments, and experience the same success and crowd appeal of measuring and weighing each Cobia caught before returning it to the sea to resume its normal life cycle. By releasing a portion of all caught Cobia, fisherman can ensure that the stocks of this fast-growing game fish will quickly rebuild. The Cobia Tube works as a user-friendly, flexible live well for any Cobia caught that is not immediately harvested. It is easy to use, easy to clean and easy to store. The Cobia Tube can be purchased online and in tackle stores worldwide where the latest in Cobia fishing equipment is carried.